Welcome to my personal blog site. 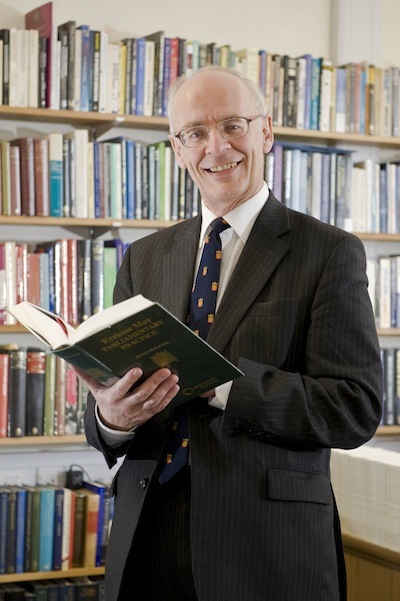 I am Professor of Government in the School of Law and Politics at the University of Hull. I also sit in the House of Lords. In short, I study politics as well as participate in it. This provides me with a unique perspective. These are my thoughts. We are working on the procedural arrangement for the vote of no confidence against Speaker. We shall be most grateful if you can kindly provide information on the said topic. 1. does such confidence motion require notice and if so, what is the notice period and whether the notice period may be waived? 2. is such confidence motion amendable and if so, who rules on the admissibility of the amendment(s)? 3. in the case that the Speaker does not resign, will the Speaker preside over the debate and if he does not, then who presides? 4. in the case that the Speaker does not resign, what is the voting arrangement of such confidence motion against the Speaker? 5. in the case that the Speaker does not resign, what is the consequence if the motion is passed? Is it a constitutional convention for the Speaker to resign if the motion is passed? Thank you in advance for your consideration of this matter. I am looking forward to receiving your favourable reply. Great site. Just tell me jow I can put it into Favourites – when next see you in the offfice! Now things are slowing down with electoral reform (time and pressure, we will get there one day 🙂 ) I would really like to understand more about government. I was wondering if you could suggest any way I could go about doing this. I know you are very busy but I was wondering if you could recommend a a couple of books on the subject ? Do you know of any good distance learning courses which could get me going. I am degree educated (BEng in Control Theory and BSc in Psychology) so I could tackle undergraduate material at least). Dave Thawley: I fear I have only just seen your message. In terms of introductory texts, I would somewhat immodestly recommend Bill Jones and Philip Norton, ‘Politics UK’, 7th edition (2010) as a starting point: it is used for A-level and undergraduate politics. There are other texts, but this does tend to prove attractive to students. It also includes recommended further reading: one can thus pursue more detailed texts on particular issues, including ministers, the civil service, parliament and so on. I fear I don’t know of any good distance learning courses at undergraduate level, other than what may be provided through the Open University. Sir, I heard you on the radio today. YOU were brilliant. Thank you for your compassion and damn right honesty and forthrightness. I wish the world knew about people like you who can influence. You’re at the University of Hull, only a stones throw away from so much crime, socio-economic poverty, lack of drive, sadness. Much more can be done. Needs to be done. Look what we have just advertised to the world prior to one of the greatest sporting events ever. Good luck – live long. May I suggest adding the “search” widget? I’m using the same theme on WordPress and have found it a useful tool. Do you foresee anytime in the near future a bill granting female succession to Peerage? I am fully aware of attempts in 2013 and 2015 but even though they got a good deal of publicity they never got any traction it appears ( at least to this Americans eyes). Who would have to be pushing for some type of reform on the subject to gain traction? Professor, might I recommend a change of hyperlinks? The university has recently undergone a major departmental reorganisation and your lordship now belongs to the School of Law & Politics within the Faculty of Business, Law & Politics.